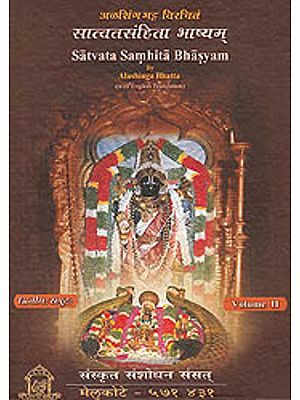 It gives me a great pleasure in writing this foreword t0 the critical edition and English translation of Satvata Samhita, the first of three Classical scriptures of Pancaratra Agama made by Dr. Prabhakar Apte. Dr. Apte was working in the Agama Kosa Project of Kendriya Sanskrit Vidyapeetha Tirupati from 1968 to 1970 and his critical edition of the second classical scripture of Pancarata Samhita has been published by Kendriya Sanskrit Vidyapeetha, in two parts. With his sound research background in Agamas, Dr. Apte has added his valuable contribution to Agamic research by critically editing and translating Satvata Samhita which preserves the hoary tradition of Satvata Dharma mentioned in Bhisma Parva of Mahabharata and it is associated with Yadusaila or Melkote, as the main scripture. Indology in nineteenth century was dominated by intensive and extensive research in Vedic studies and allied disciplines. Twentieth Century highlighted the areas of Paninian grammar, Comparative Philology and linguistics. The present century will be marked by study in Agama and Tantric field. With growing interest of Agamas among scholars in India and abroad, I am sure this publication will be well received by scholarly world. I congratulate Academy of Sanskrit Research, Melkote for nicely bringing out the edition. I specially congratulate the Academy of Sanskrit Research for making the copy ready for publication with phenomenal speed. I appreciate the skill and efficiency of the research staff for employing updated computer technology, especially in printing Slokardhanukramani in Roman Script. I wish the Academy & the young & dynamic Director, Dr. Bhashyam swamy, a bright success in all respects, in days to come and confer my blessing to the Academy to emerge as Apex Body for Agamic Studies, catering to the readers of Scholars through Web-site on Agamas. The Academy of Sanskrit Research, Melkote had submitted to the Tirupati Tirumala Devasthanam, Tirupati a Project Proposal for financial assistance to undertake Extensive Research on Pancaratra Agama. ‘A However the TTD, Tirupati has since extended its financial assistance to undertake the publication of a Book on Pancaratra Agama. 1. It is to fulfill the wish of H.H. Sri. Yadugiri Yathiraja Sampathkumar Ramanuja Jeeyar Swamy of Sri Yadugiri Yatiraja Mutt of Melkote who had wished that till now no body has ventured to translate this valuable text —Satvata Samhita of Pancaratra Agama which is being followed at Melkote, from Sanskrit to English, for the benefit of larger interested readership. Incidentally, since the Pontiff attained the lotus feet of the lord on 15th April 2005. The book is dedicated to his memory as a humble homage to His Holiness, by fulfilling his wish by bringing out this Melkote edition. 2. The earlier editions like Kanchi & Varanasi editions do not have the value-additions like ‘Slokardhanukramani’ with chapter- wise reference in Roman characters. 3. Another feature of the Melkote Edition is the spelling of grammatically approved Sandhi—Splits. 4. Further, here, in this edition, there is a value addition over the Varanasi edition related to table of contents by showing page- numbers against each topic and also having separate table of contents in English. In fact, this is only a beginning with regard to the Melkote Edition of Satvata Samhita as the work will not be complete if we do not bring out a critical edition and translation into English of the original the valuable commentary on Satvata Samhita by Pt. Alashinga Bhattar, the veteran of rich Yadugiri Heritage of Scholars and aptly edited by another eminent oriental scholar Prof. Vrajavallabha Dvivedi of Varanasi. In fact we are well suited for undertaking this work as the Academy is blessed with the possession of the original palm leaf manuscript of Alashinga Bhasya (or commentary), incidentally donated to the Academy by none other than the above reffered pontiff of Melkote Yatiraj Mutt,— H.H.Sri. Yadugiri Yatiraja Sampathkumara Ramanuja Jeeyar Swamy. Thus I am sure that using this Melkote Edition will richly benefit the readers. Hindu Dharma is said to comprise of two major cultural streams. Viz.Nigama — Agama. Thus, it is also known as "Nigamagamatmaka Dharma? N IGAMA covers the literary and ritual traditions followed under Vedic culture. i.e. it covers the four Vedas. (Rg; Yajus; Sama and Atharvana). On the Other hand, AGAMA represents enshrined image-worship and the social life governed along with it. It is also known as Temple - Institution. There is evidence to show that this has a definite period of commencement. It is believed that it commenced around the end of Dvaparayuga and the beginning of Kaliyuga. Mythological and Historically the antiquity of this fold dates back to Bhismaparva of the epic Mahabharata. There is also a geographical connectivity to locations like Kashmir. Archana and Seva — i.e. Offering Worship & Service to the Lord is believed to have commenced from the first devotee — Sankarsana of Lord Vasudeva (Visnu or Krsna). It is he (Sankarsana) who promulgated the Satvata Dharma. Lord Krsna is praised as "Sanatana Sasvata Dharma Gopta?’ In Kashmir literature it is stated that Sasvata is termed as Satvata. It is this Satvata Dharma which has been termed as PANCARATRA. It is to be noted that in the Pancaratra Agama, both Vedic as well as Tantric Mantras are pronounced; where as in the Vaikhanasa Agama and Saivagama principally Vedic and Tantric Mantras are respectively recited. While Pancaratra Agama has 108 Samhitas (Scriptural texts) the Vaikhanasa has only 10 and Saiva has 28. In Mahabharata it is revealed that Lord Narayana who is also known as Vasudeva himself spelt out the entire tenets of Pancaratra Text. “Pancaratrasya Krtsnasya Vakta Narayanah Svayam? Satvata Samhita is believed to be the first and foremost of all the Samhitas and it is further interesting to note that this Satvata Samhita is one and the only scripture to bear the same title as that of Satvata Dharma. Thus it is to be regarded as the most valuable and foremost Samhita. This Satvata Samhita along with 2 more Samhitas that followed - viz. Pauskara and Jayakhya are popularly known as “Ratnatraya" and these dates back to c.300 to c.500 AD. Next comes the Ahirbudhnya Samhita which is dated only after c.500AD but before c.800AD. The next to follow are marked as post classical or Arthopapadika Samhitas - they are Iswara, Parameswara and Padma. The evolution of manifestation (also termed as Vyuhas) of worshipping the Lord Vasudeva dates back to Mahabharata period.- The e conception of different Vyuhas are classified under four stages. i.e. Eka; Dvi; Tri; and Catur and they are linked to Vasudeva; Sankarsana; Pradyumna and Aniruddha respectively. These Vyuhas explain the cosmic evolution which is also associated with Pancaratra. The Caturvyuha which is revealed in the later section of Mahabharata seems to represent the earliest phase of ‘Samhita’ religion and philosophy. 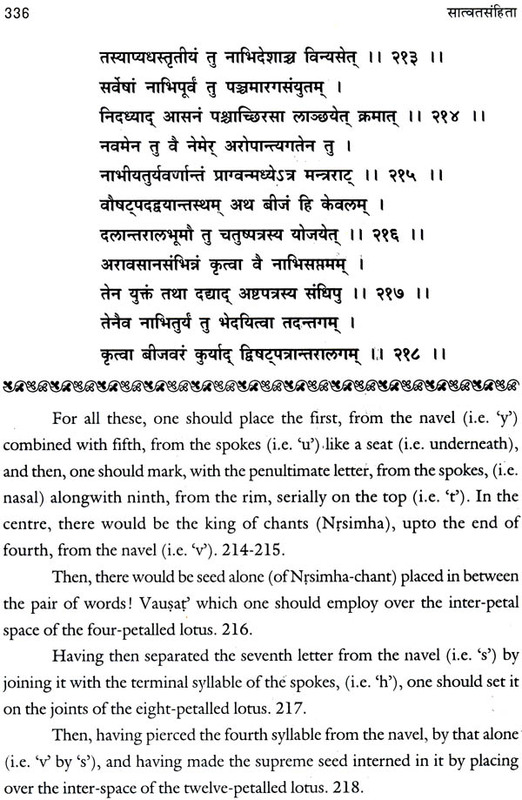 The reference to Parasurama’s instruction to Narada Muni which deals with leading the humanity to follow Satvata — Kriyamarga is more fully described in the above said earliest Samhita i.e Satvata Samhita — presumed to be the earliest document on Pancaratra. It is to be noted that Satvata Samhita relates to or refers to a doctrine known as "Brahmopanisad" depicting four fold path of worshiping the God, aimed at attaining Moksa (Salvation). i. T he Yogins, who adopt the 1st path are eligible to worship God dwelling in their heart. ii. In the second path, the vedic Brahmins worship God in his chaturvyuha form accompanied by chanting mantras. iii. The third path of worship is by the devotees who worship the Lord in their chaturvyuha form but without chanting mantras. iv. The fourth path represents the path of worship of mystic diagrams - yantra mandalas presided over by the vibhava devatas. As a furtherance of this path the ‘Siddhapurusas’ attempting to bring together the different worshippers belonging to the yogic, vedic and tantric cults. Thus evolved the five fold tenets of Pancaratra religion - para; vyuha; vibhava; antaryami and archa. As revealed in Satvata Samhita, which also covers the practical aspects of temple building and iconography. The Area (Temple) worship followings seems to have gained momentum during the time of Pauskara Samhita. By the time Jayakya Samhita this showed further expansion with the growth of Mathas, Religious Schools around temple surroundings. At this stage application of tantric influence formulae also appears to have increased. By the time of the evolution of Isvara Samhita i.e c.600 to c.900 AD the classical Samhitas had already attained scriptural status. It was at this juncture that the Vaikhanasa School of followings was also recognized as an Agama on par with Pancaratra. These are regarded as svayamvyaukta ksetras while Venkatadri adopted Vaikhanasa Agama the other three seats are governed by the three schools of Pancaratra agama viz. 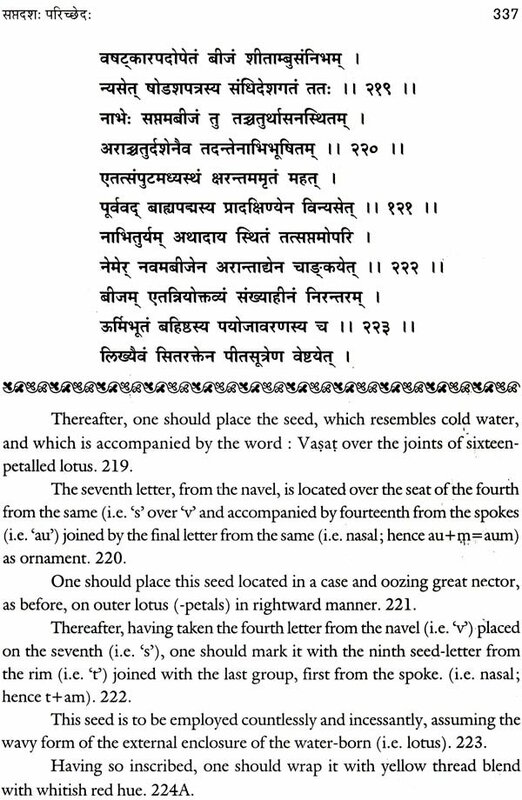 Satvata—Iswara @ Melkoteg; Pauskara-Parameswara @ Srirangam and Jayakya-Padma at Kanci. Further each of these four Ksetras have been allotted a deity; a mantra; a scripture and an explanatory text. 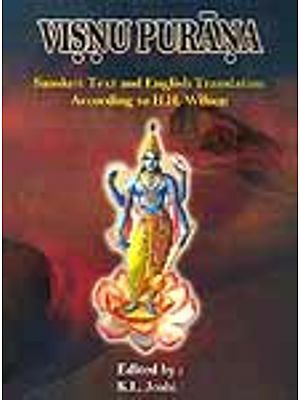 In fact, this is only a beginning with regard to the Melkote Edition of Satvata Samhita as the work will not be complete if we don’t bring out a continued edition of translation into English of the original the valuable commentary on Sasvata Samhita by Pt. Alashinga Bhattar, the veteran of rich Yadugiri Heritage of Scholars and aptly edited by another eminent oriental schlar Prof. Vrajavallabha Dvivedi of Varanasi. In fact we are well suited for undertaking this work as the Academy is blessed with the possession of the original palm leaf manuscript of Alashinga Bhashya ( or commentary), incidentally donated to the Academy by non other than the above referred pontiff of Melkote Yatiraj Mutt,- H.H.Sri. Yadugiri Yatiraja—Sampathkumar Ramanuja Jeeyar Swamy. I am confident mat this work also commences at the earliest and the publication is released in the coming year itself. I will be failing in my duty if I don’t thank the New, young and dynamic Director, Dr.Bhashyam Swamy as well as the able Administrator and Registrar, Sri.B.S. Krishna Prasad of the Academy who have given me die opportunity to undertake the task of Translating and editing this Book. My sincere thanks are also due to the Academy’s Scholarly and Technical team lead by Vid.S. Narayana. Sri.S. Kumar, the Asst. Registrar deserves a special mention, as he was always kind enough to extend all the timely administrative and financial support through out tenure of the project work.